This handsome tree swallow has long, pointed wings and a body streamlined for swift flight and lots of time on the wing. Adult males and females look alike, with an iridescent sheen, except for first-year females, which are colored dull brown. Another blue bird has been back in Westborough for about a month, but it’s not the bluebird that everyone thinks of, although you might see it around bluebird nest boxes. You’ll often find this native bird flying low over water, such as Mill Pond, swooping and swerving through the air and swallowing insects non-stop. This style of eating and swallowing while on the wing is a clue to its identity – it’s a tree swallow (Tachycineta bicolor). Tree swallows and other kinds of swallows are so well known for their swift flight that they’ve long been associated with travel in folklore. They’re well suited to life on the wing, with streamlined bodies and long, flat, pointed wings. Besides eating on the wing, they also drink and bathe while flying, simply by touching their beak or body to the water as they skim over it. Because they dine so heavily on insects, tree swallows probably won’t appear at your bird feeder. They come north to breed and nourish their young on our spring and summer insects. In the fall they retreat to more southern locations, from Virginia to Central America, as insects become scarce here. Where can you go now to watch tree swallows in action? For the best views, spend time near water – along the shores of Mill Pond, Lake Chauncy, or Sandra Pond – and watch them flying and feeding on the wing. They eat all day long, but the best times to go are mornings and late afternoons, or any time after a rain – when insects are out in force. The “tree” in their name refers to the fact that tree swallows nest in holes – tree holes to be exact. Watch for them going in and out of holes in dead trees or stumps, especially near water. A pair might be building a nest, with the female doing most of the building, or feeding their young. In June, look for several tiny heads – with mouths gaping wide – poking out of a hole to be fed as the parents make fly-by deliveries. Another place to see tree swallows is just about any place with bluebird boxes. Tree swallows compete with other hole-nesting birds such as bluebirds (Sialia sialis) for a scarce resource – nest holes (often made by woodpeckers). As people have cleared land for agriculture and development, and continue to conscientiously remove standing dead trees from their property, tree holes have become less common. The nest boxes that people put out for bluebirds are as just as attractive to tree swallows, and the entrance holes are just the right size. Look for tree swallows perching on nest boxes. In the face of tough competition for nest boxes, how can people make sure that bluebirds get to use at least some of the bluebird boxes? One way is to put up nest boxes in pairs, according to local bluebird enthusiast Marty Newark. Tree swallows and bluebirds may be competitors, but they also avoid nesting right next to their own kind. When nest boxes are paired, tree swallows and bluebirds accept each other as neighbors rather than live next door to their own kind. Both male and female tree swallows defend their nests against predators and competing birds, including – or maybe especially – other tree swallows. Tree swallows also fight each other over feathers from other birds such as ducks and geese, which they use to line their grass nests. 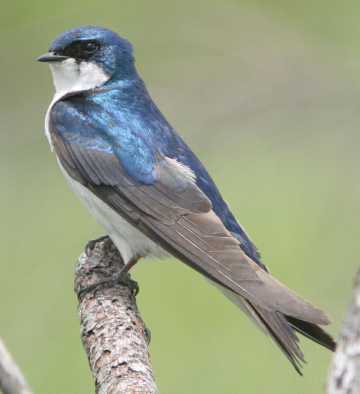 If the male of a tree swallow pair vanishes, as sometimes happens in nature, an unmated male typically takes over the nest – and kills the existing nestlings. With nest holes in short supply, why don’t tree swallows and bluebirds – and other hole-nesting birds such as wood ducks, for that matter – simply change their habits and nest elsewhere? The short answer is that nesting behavior is built into their genes. It doesn’t usually change quickly. In fact, closely related kinds of swallows seem to have similar nesting habits. Scientists studying the DNA of swallows have found that tree swallows and several other North American swallows can be grouped together by similarities in their DNA, and they can also be grouped in a similar way by their habit of nesting in holes. In contrast, barn swallows (Hirundo rustica) and certain other swallows around the world can be grouped together by DNA as well as by their habit of building nests of mud. Yet change has taken place over extremely long periods of time. Researchers believe the ancestors of today’s swallows probably lived in Africa and had different way of nesting. They dug burrows for their nests, much as bank swallows (Riparia riparia) do today. But are there recent changes? Tree swallows and other kinds of swallows have actually adjusted their nesting habits to take advantage of things that humans build. Besides nesting in tree holes, tree swallows now also use nest boxes. Barn swallows used to build mud nests on cliff ledges and in small trees but now build them mostly in buildings and under bridges. Human civilization has affected tree swallows in another way besides making tree holes scarce. In response to climate change related to global warming, tree swallows in North America are now laying eggs earlier. This change corresponds to warmer spring temperatures. Over only 32 years (1959-1991) the timing of tree swallows’ egg laying gradually shifted earlier by 9 days. On balance, tree swallows are doing well in spite of the changes that humans have caused. With its ponds and lakes, five major swamps, two rivers, and a growing number of nest boxes, Westborough offers an attractive environment for them. Enjoy them while they’re here for the spring and summer.